These no-bake peanut butter truffles will be the highlight of your holiday cookie platter. You can’t go wrong with these treats! Can you believe we’re only 1 ½ weeks until Christmas? Are you ready? Are you pumped?? I sure am! This week, I’m finalizing our Christmas dinner menu, starting and finishing shopping (fingers crossed! ), binge watching #alltheChristmasmovies, squeezing what feels like two weeks of work into my final 4 ½ days before two full weeks off. I will also be putting five fantastic posts out into the world for you guys. I’ve been slacking here a little since Thanksgiving – I certainly needed a little break – but I know you’re gonna love what’s coming this week and early next. First up are these peanut butter truffles. These peanut butter truffles are no-bake, no fuss, no muss Christmas treats that will blow any peanut butter-chocolate lover away. They’re SO EASY to make, too! You’ll mix a quick peanut butter dough up, roll it into balls, freeze, and dip them in chocolate. 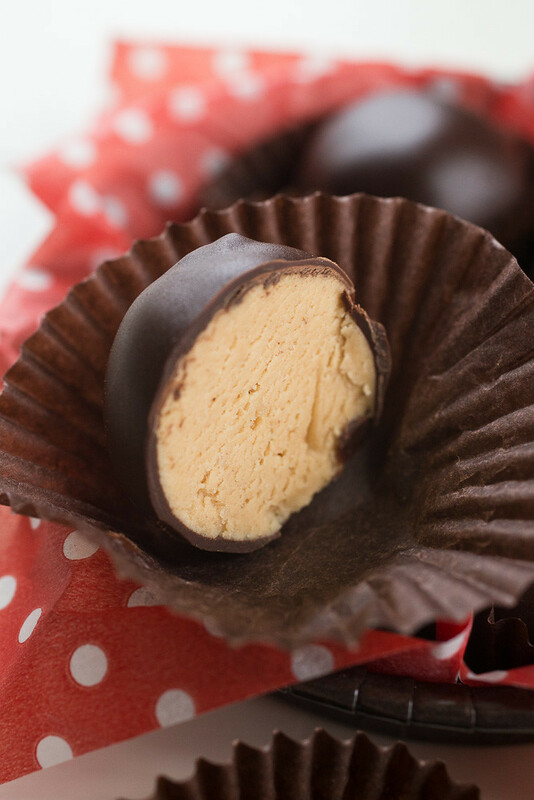 Who could possibly turn down rich and creamy peanut butter truffles covered in chocolate? NOT ME! 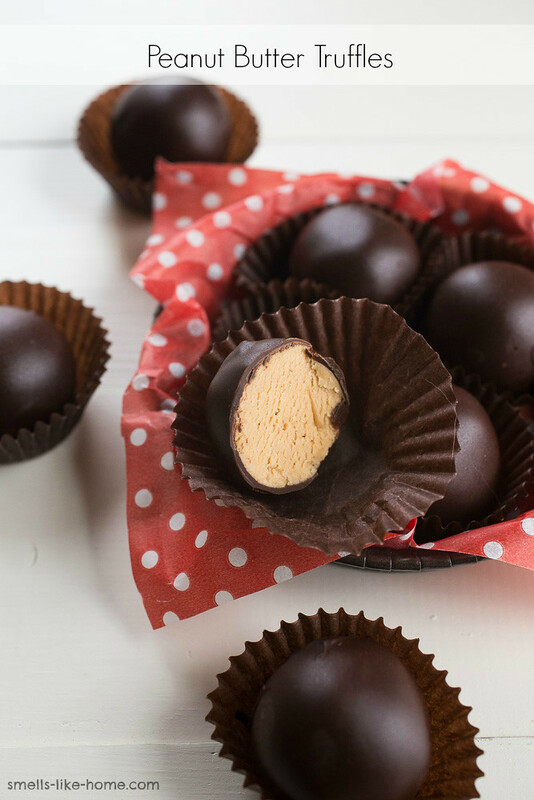 These oh so simple peanut butter truffles are sort of like buckeyes but a little more formal and without all the trouble it takes to make peanut butter cups. If you wanted to dress them up a little, you could drizzle some chocolate over the tops or sprinkle them with chopped peanuts or chocolate sprinkles. Make these Christmas treats now and freeze a bunch to keep for Santa’s cookie plate – he’ll love them! And if you’re in need of other no-bake treats for a holiday party or cookie tray, how about some peppermint pretzel marshmallow fudge or some booze balls? These peanut butter truffles can be made up to 1 month in advance and frozen in an airtight container. Thaw them in the fridge overnight before serving. In the bowl of a stand mixer, beat the peanut butter and butter together until completely combine and the mixture is fluffy. Beat in the vanilla and salt. Add the powdered sugar and stir on low speed until fully incorporated. Line a baking sheet with parchment or wax paper. Scoop out rounds of dough with a small cookie scoop. Roll the dough into balls with your hands and place the balls on the prepared baking sheet. Freeze for 1 hour. Melt the coconut oil in a small saucepan over medium-low heat and whisk in the chocolate until melted. Remove the pan from the heat. Remove the baking sheet from the freezer. Dip the end of a toothpick into the melted chocolate and stick the toothpick into one of the peanut butter balls. Pick up the ball and roll it around in the chocolate to coat; gently shake off the excess chocolate into the pan. Dip the end of a second toothpick in the chocolate and nudge the truffle off the first pick, sealing up the hole with a little extra chocolate from the picks. Repeat with remaining peanut butter balls. Allow the chocolate to set up in the refrigerator for at least 2 hours before serving. Refrigerate for up to 1 week or freezer for up to 1 month. I ADORE that silky pb filling in the truffles!!! delicious! Oh yeah, these truffles are quite a hit. Hope you love(d) them!